Sony’s Katsunori Yamanouchi admires the new 4K control room at Montclair State University, complete with a Sony MVS-7000X switcher. These days many schools and universities are opening new state-of-the-art media centers and boast about the “professional level” equipment they use to provide students the best education and practical experience possible. The new media center at Montclair State University, in New Jersey, however, takes that claim one step further: the equipment they use for teaching has been operated by NBC for a past Olympics Games coverage and their new 4K production studio set came from Comedy Central. No joke. The university’s new 105,000 sq. ft. School of Communications and Media opened unofficially with the start of the 2017 fall semester, but the school recently cut the proverbial ribbon in late September on the $55 million (including nearly $10 million in technology alone) multi-discipline building that—with its open newsroom and classroom designs and radio and TV studios and the school’s newspaper “The Montclarion” offices in close proximity to each other—fosters collaboration between like-minded students and teachers in a way that mimics the real world of journalism and digital media production. When things get busy, everyone is on top of one another, and that’s the way teachers like it. They call it “active learning” and want their students to work as they would in a real job as a reporter, producer or technical person facing a deadline. The school offers degrees in communication, television and digital media, filmmaking, journalism and public and organizational relations. 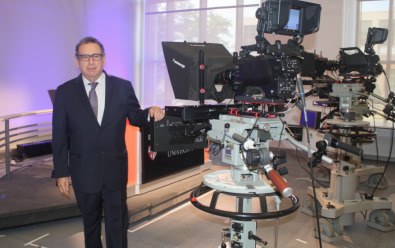 While other broadcast equipment vendors—AutoScript, Avid, RTS, Solid State Logic, Vinten and Yamaha—have generously supplied equipment, software and systems to the new center, Sony Professional Solutions Americas, the company who’s U.S. headquarters are located closest to the school, has made a larger commitment and provided most of the technology to support a 4K (UHD) broadcast production studio and control room, in addition to a multitude of HD gear. Sony and Daniel Gurskis, Dean of the College of the Arts, said they would be “strategic partners” in the school’s on-going technology initiatives. Sony donated and deeply discounted a wide variety of professional production equipment; like studio and ENG-style field cameras, robotically controlled PTZ cameras, and a large MVS-7000X 4K live video production switcher that was used by NBC during the 2016 Summer Olympic Games in Rio de Janeiro, Brazil. Teachers said it’s still in fine working order and gives students a bit of a jolt when using it to produce a daily live newscast on campus life and several taped shows—which all appear on the local cable providers, the school’s private TV network and the Internet and social media. Mark Effron, Newsroom Coordinator/Instructor of the School of Communications and Media, said the new 4K facilities inspire students to reach their full potential. The layout of the media center includes three production studios, one 40x 56 sq. ft. space with four Sony HDC3400 4K cameras (with Fujinon lenses), a second 40x46 sq. ft. stage with three Sony HDC-1400 HD cameras and a third 40x46 sq. ft. space with four HDC-300 HD cameras. The 4K “Studio A” features a colorful set retrofitted from the “The Nightly Show with Larry Wilmore” show on Comedy Central, thanks to a donation from NEP Studios, in New York City. Sony robotically controlled PTZ cameras are mounted on many of the facilities' walls. Sony personnel also oversaw the design and integration of the studio facilities since 2015, working closely with technology partners KMH Integration (Brooklyn, NY), Commercial Technology Contractors, Inc. (Clifton, NJ) and CCI Integrators (Sloatsburg, NY). Katsunori Yamanouchi, Sony’s new Deputy President for its Professional Solutions Americas company, was on hand for the ribbon cutting and personally expressed his desire to stay involved with young people. With its headquarters in Park Ridge, NJ, He said they feel a sense of community with the school. The new iNEWS-centric newsroom features an open design that mimics a professional newsroom and encourages collaboration between students and teachers. 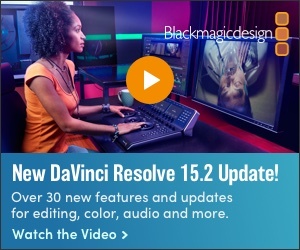 Three control rooms—one 4K capable the other two HD only—are similar in makeup, with AutoScript prompting software, Avid iNEWS newsroom integration, Crestron lighting controls, an SSL C-10 audio console and Vizrt graphics. Just like what you would find at any TV station in the country. There’s also a open-style newsroom with numerous Avid Media Composer edit stations connected via an Avid iNEWS system and Avid Nexus Storage, and a large 200-seat presentation hall with a 7:1 Audio DCP-4K projection system, Sony 900 HD switcher, six Sony PTZ cameras mounting on the walls and a Yamaha QL5 audio console. The hall will welcome the local NJTV TV station as it hosts the 2017 New Jersey NJ Lieutenant Governor Debate on October 16th. All of the equipment and system are connected by some 170 miles of SDI coax, fiber-optic and Cat6 (IP) cable, with 4K and HD signals managed by a medium-sized Evertz router. The facility is connected to the outside world via a Vyvx dedicated fiber line. Faculty said the real accomplishment of the new center—besides the use of numerous chairs with wheels that allow students to move about the classroom quickly as they work on projects individually and in groups—is that it brings together all of the departments under one roof after years of shuttling students between different buildings. That fosters collaboration on many levels. Students feel a sense of awe in the new facilities and what they can accomplish there. Moving between print media and the Internet is fast and easy. Shooting a 4K interview is fun and accessible. And the professional experience of the teaching staff giving real-world guidance is second to none. The school’s new 4K studio features a full sized set once used by The Nightly Show with Larry Wilmore” show on Comedy Central. Along with benefiting students of the School of Communication and Media department, the new studio facilities will also be promoted for outside clients to use—with the money going back into the Communication and Media department. An ancillary benefit of the school’s new facilities is that there isn't another studio of its quality for miles around and the school’s rates will be cheaper—but they encourage outside clients to let students participate in the production. The university’s School of Communications and Media must be doing something right. Tzanis said that in 2016, 14 students got full time staff jobs at NBC and anther seven did so this year. Students have also been placed at ABC, CBS and Fox.